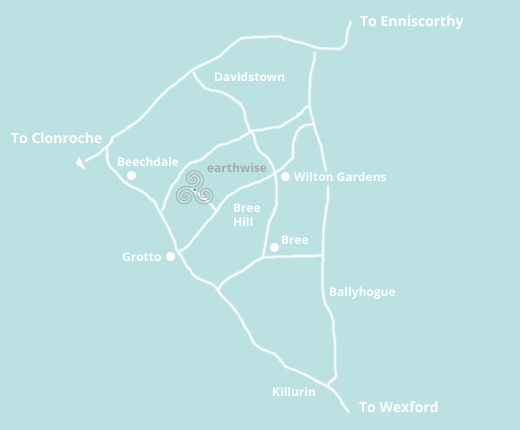 Address: Earthwise Yoga, Wilton Mills, Craane, Bree, Enniscorthy, Co Wexford. Where to find Earthwise Yoga? Earthwise Yoga can be found by the ruins of Wilton Mills, right on the banks of the beautiful River Boro at the end of a quiet country lane which leaves Craane road in the foothills of Bree, Enniscorthy, county Wexford. Take the N30 heading north towards Enniscorthy. Drive through Clonroche. After Clonroche, turn right onto R730 (Wexford road). After 4.3KM, see grotto on right hand side at a minor crossroads and take the LEFT turn here – there is a small sign for “Yoga”. Drive 1.8KM, see sign for yoga indicating LEFT turn. Take this left, drive down the lane and over the bridge and arrive at yoga! After 14.8KM, drive past petrol pumps and hardware centre on left hand side; see grotto on left just past this at a minor crossroads. Take the RIGHT turn here – there is a small sign for “Yoga” on right entrance of road to right. Drive 1.8KM, see sign for yoga indicating LEFT turn. Take the N30 heading southwest for New Ross. After 10.7KM take major left turn onto R730 (Wexford road). After 4.3KM, see grotto on right hand side at a minor crossroads and take the LEFT turn here – there is a small sign for “Yoga”. Drive 1.8KM, see sign for yoga indicating LEFT turn. Take the N30 heading southwest for New Ross. After 2KM, take LEFT onto L2045 as main road veers sharply to the right. Drive for about 1.8KM and take right turn signposted Bree. After 4-5KM road veers sharp right angle to the left around the stone walls of Wilton Gardens. Follow this road around and take the RIGHT turn opposite entrance to Wilton Gardens. After 2.3KM see sign for yoga indicating RIGHT turn. Take this right, drive down the lane and over the bridge and arrive at Earthwise!